What do you do when you see a horse this broken? And the price to “bail” him from the kill pen is $870 with nothing but a guess at what’s wrong with him. UPDATE: LS Black Bear was purchased by All The Kings Horses Equine Rescue. They accept donations on their website. I donated and am glad this horse is safe. A year ago, LS Black Bear was offered for sale as a seasoned trail horse with cutting and sorting experience. Hard to believe it’s the same animal. All across the country, horses are going through low end auctions, fueled by the threat that the horses will sell to kill buyers and be shipped for slaughter. These auctions do not guarantee soundness, do not allow vet exams, and encourage phone bidding during the auction where you might find yourself bidding against the house. This particular horse is from an auction house in New Jersey, but this scenario is played out over and over again in many places. This just happens to be the horse that’s in front of me today. The sales video shows a horse that can barely walk. A horse that was sound less than a year ago. A horse that now has an unsightly bump on his croup and dicey looking front legs. But, what are you supposed to do? Pay the exorbitant “bail” money? Let the horse get sent from auction to auction or on to a kill buyer? Probably the answer is to cut the brokers out of the equation and buy directly from New Holland or similar auctions. A horse like this probably cost $200 or $300 on Monday. By Wednesday the price was up to $870. At a lower price, someone might want to take a chance on a horse or help the horse over the rainbow bridge. This lovely Hungarian Warmblood mare ended up on a great home and is sound and sane — although quite green. on the same auction site about two months ago. I contacted her breeder, who, although she was not in a position to take her back, was able to provide information to a prospective buyer, who took her to a dream home in Virginia. The mare is sound, sane and a spectacular mover, although very green. The new owners sent me video that brings tears to my eyes because the horse looks so happy. For $1K she was a pretty good deal, even with the mark up that the buyer had to pay the broker. But the heart string marketing that tries to extort $820 for a horse that can’t walk? That’s just criminal. What do you think? How would you help the horse who fall through the cracks? Should their be options for owners to euthanize damaged horses at a reduced rate so they are not tempted to get the last dollar out of a horse at an auction? Although I don’t approve of ransoming sick and old horses, I admit that when I can find a previous owner, I contact them to see if they might take the horse back. It’s a long shot, for sure, but if it was a horse I used to own, it would be worth it to me keep the horse out of the system. Thank you for writing this article. It is a difficult topic without a lot of easy answers. There seems to be a middle market that has developed, preying on people’s heart strings, that is running up exorbitant “bail money” for these horses. I agree there should be some low cost euthanasia option, without stigma, that would allow people to give horses a safe and peaceful end. I know in my area that euthanasia and body disposal is very expensive ($1,000+). There should not be any shame, if people do not have the means to pursue extensive medical diagnostics, to let go of an unsound horse. This is not to say that horses are disposable, but to give people an option, should they have limited means, but want to do the right thing. Also, would love to see further community awareness of abuse of rescue, such as what has been reported is going on at California “rescue” HiCaliber. It’s really a shame that euthanasia is so expensive. I’m sure that it contributes to the number of people who send their horses on to an auction, where they may make only a couple of hundred dollars but they save a thousand. What really kills me is the horses that are sent to auction by people who can do better. There was a horse recently that had severe DSDL. Once a fancy show horse, he was sold downstream by his young owner where he ended up at an auction literally unable to take more than a few steps. People who let their horses deteriorate to that condition under their care should be banned from owning animals. That may actually be a second post. It really upset me to learn that horse had basically been used up and passed around knowing he was severely damaged. That poor horse could barely walk and yet he was advertised as being “sound for light riding”. I downloaded the video before they could pull it down. There is a third case that I know about but can’t write about it until the lawsuit is settled. My preference is always to work with legitimate, volunteer-staffed organizations where the money goes to the horses. For many years I fostered OTTBs for CANTER. Great organization, fiscally responsible and absolutely honest about the horses they own (trainer owned horses are more risky) and their limitations to make sure they are placed with people who know what they are getting into. My own Freedom was a horse that I started off fostering and decided to keep. That horse cost me $300 and I’d fostered him for several months before I decided to adopt. I hate that places like Cranbury are distracting people who want to find good horses away from organizations that offer adoptions at reasonable prices and with the security of a vet exam and an honest assessment. Just saw your article. Surprised to see the picture of LS Black Bear I was able to find and put up on the site, in your article on here. Dom, sad that you feel this little black QH story is “Drama”. He does not have a bump on his croup, it’s muscle nor does he have dicey legs. But, yes he is lame and from what I can see with my 40 plus years in the h/j industry via the video , he is lame in his right front leg. His fetlock area, easily seen, my guess lower digital flexor tendon. He could possibly just have a bowed tendon, not hard to rehab, don’t know if there would be any limitations based on what he was doing in the past. This is just an assumption based upon watching the video and pausing the frames and watching his movement as well. He would need Veterinary Dx with ultrasound. Everyone is still fighting hard for this guy, he didn’t ship yesterday, because we believe in him. He has a past and is more then proven. 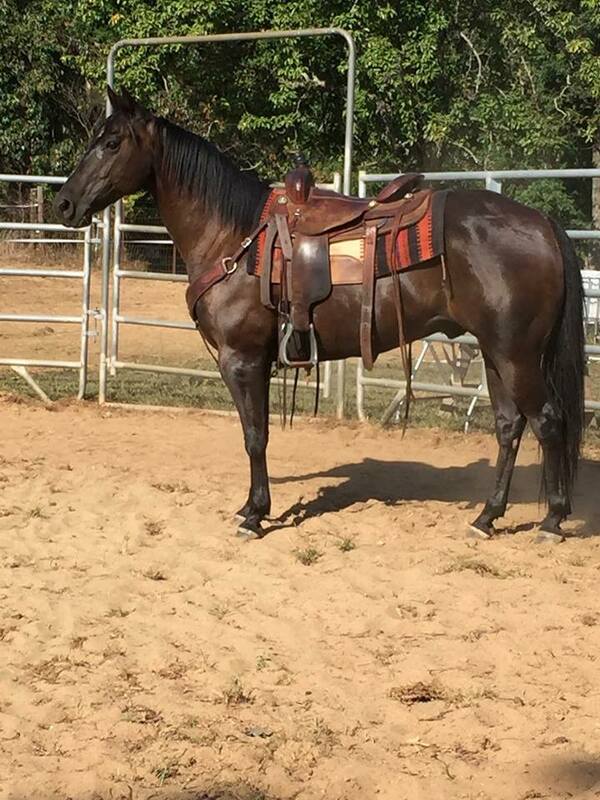 His prior owners have great things to say about him, the only thing we know he is not really a beginner’s horse for someone who wants to do ranch sorting and he loves the trails. He’s been sticked at 14.2 though he doesn’t have a measurement card, that would in fact make him a large pony. I can’t telll you how many of our “A” Show Horses on the road, end up with torn suspensories much more severe then this and are rehabbed and back out there in the ring showing week after week. How many TB’s come off the track with bowed tendons. There is a place for this guy and trying to help him find it, is the right thing. I also found several photos of LS Black Bear from past ads. There is quite a lot of info on him on the Internet because he’s been passed around a lot over the past two years. In fact, using those ads, I reached out to all of his previous “connections” to see if there is a previous owner who would step up to the plate and help him out. When the Hungarian Warmblood mare was in the #10 pen, I was able to talk to her breeder and she, in turn, talked to the people who were interested in her, which resulted in her purchase. I agree with you that finding a place for this guy is the right thing. I just disagree with the tactics and the pricing used by Cranbury. There is no need to put a price tag that high on a horse when he is visibly lame and there is no diagnosis. It becomes a blackmail situation where people step up to help a horse only because the situation is so dire and it wreaks of opportunism. If Cranbury was more up front with the issues — remember that lovely TB just a few weeks ago who had severe DSLD (since confirmed by a vet) who had been a show horse jumping 3’6″ just a year ago? — then the right people would be more willing to help. As I recall, that poor horse was advertised as suitable for “light riding”. I have been involved with rescue and rehab for the past 15 years. I’ve fostered and rehabbed several horses from CANTER. In fact my own OTTB came to me as a foster and I decided to keep him. I am 100% for the horses, but I think there needs to be honesty from the broker side as well. There are too many stories out there of horses coming from Cranbury with serious health problems who land with people who don’t have the knowledge or financial resources to deal with those issues. Situations like this are always a conundrum. There is the specific horse in question who needs help and there is the system problem of horses that are abused, left with medical problems untreated by previous owners, dumped at auction and then ransomed off by brokers. IMO (and you may disagree) there needs to be more awareness of the root problem — that too many people don’t do right by their horses. Maybe it also means that the veterinary industry needs to offer less expensive euthanasia options for old horses, so we don’t see so many senior citizens at auctions like New Holland, but none of this will change of we continue business as usual. Yes, I truly hope someone can step up to the plate for this guy. Shame on the people who broke him and then sold him down river. But shame on Cranbury for putting a price on him that puts him out of reach for the softhearted and the rescues who would do more. Right now those people could go directly to New Holland and pull three horses to save for the same dollars. Which is the right choice? Bravo to you for writing this post and for reuniting the mare with her breeder and a new home. I didn’t know you fostered for CANTER! That’s a very fun fact. I don’t even know what to say about rescues and auctions. I tried valiantly to get a horse from a rescue circa 2013 and the only groups I had positive interaction with although it didn’t work out were New Vocations (they don’t adopt west of the Mississippi) and CANTER CA. There is a large and very visible all-breed rescue that celebrities out here have adopted from who did not have the decency to respond to my application. I went to the property for a tour and saw a gorgeous gray warmblood that had been shipped from Canada, but the potential buyer didn’t want the horse and it was too expensive to ship back so it wound up at the rescue. I was interested in that horse and a TB. I got a wonderful tour of the property and left my name. I now get all their marketing materials for donating to the cause. I find it gross that they didn’t have the decency to respond to me/my application when I’m a fantastic horse owner who should have at least had the chance to test out one of their horses, yet they hit me up for money–to attend their annual gala banquet and such. I haven’t been on their site lately since I have a horse now and it doesn’t matter anymore, but it seemed like there was not a lot of turnover of the animals. I would think a rescue would want to rehome as many as possible so that they can welcome in more. So unless a horse is permanently lame and going to live out its days on their property, it would seem that there would be new horse faces popping up on their website. And another friend who is also an amazing horse owner had the similar cold shoulder treatment by this rescue. Just remembered that. But the worst part is this same “rescue” turned down a different friend who has been volunteering there for years to adopt an older warmblood gelding. There was a condition that if she adopted him she HAD to board him at a certain barn (not close to her home) and that she HAD to take lessons from a certain trainer (who incidentally tried to sell this friend on one of the yearlings at his place–she said, “I want a horse I can ride.”) She was basically told she wasn’t ready to own a horse. Which I find laughable since she owned horses in her yard as a kid and she has advanced degrees and a solid income and is the kind of person who always follows through on things. I stopped following HiCaliber on social media a while ago because their posts were too coarse. I guess that’s the nice way of saying they swore too much and were just too edgy for my personality. Since then I have started hearing rumblings of crazy things going on over there. There’s definitely no shortage of material for blog posts or articles on the state of horse rescue! Some rescues are very hard to deal with. I got involved with CANTER because the New England chapter was run by a friend of mine. I was always humbled by the time and effort spent by the volunteers. They also did a great job of supporting fosters. Freedom was a horse I took in as a foster but then ended up keeping.